The Dakar 2019 came to a close as the 10th and final stage of the rally concluded successfully. As usual, there were a lot of ups and downs, heartbreaks, broken bones as well as bruised egos. 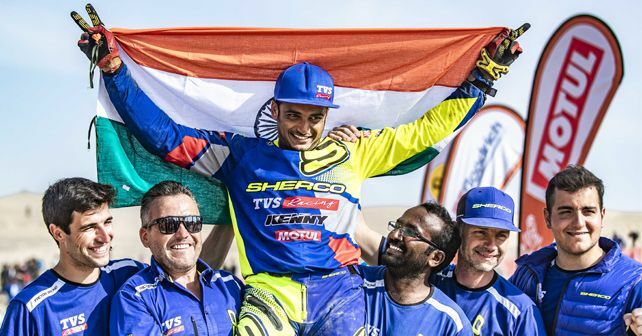 However, for motorsports fans back in India, there was only one performance that really mattered - that of Aravind KP, who came out unscathed from the punishing atmosphere of Dakar 2019. The Sherco TVS rider finally managed to conquer the Dakar rally in his third attempt as he crossed the finish line after the final stage. This meant Aravind was the only Indian to finish this year’s Dakar rally. Hero MotoSports and Aravind’s compatriot CS Santosh was also in the running this year, until he crashed and retired in stage 5. Aravind finished the rally in 37th position overall. This was his third appearance in Dakar. On his first two outings in the rally in 2017 and 2018, Aravind was not able to finish the rally. So, of course, Aravind had a lot of pressure going into the 2019 edition of Dakar but, thankfully, he has got it off his chest by completing the gruelling 11-day battle in sand dunes, beaches, and rocks of Peru. Aravind’s teammates - Adrien Metge and Michael Metge – finished the rally in 22nd and 25th positions, respectively. The only non-finishers from the team was Lorenzo Santolino, who retired in stage six owing to a nasty crash. Although Lorenzo was a rookie at this year’s Dakar, he was the fastest rider of the team and was in top 10 in the third stage. While Santosh’s retirement in the early stages was a big blow to Hero MotoSports, the Indian team finished the season on a high as they yet again managed to be in the top 10. And just like last year, it was Oriol Mena again who managed to break into the top ten as he finished the rally in 9th position overall. The team's third rider, Joaquim Rodrigues, who was making a comeback after his massive crash in Dakar 2018, made it to the top 20 as he was placed 17th in the final standings. As for the winners, KTM’s Toby Price defied all the odds to take home the Dakar 2019 crown in the motorcycle category despite dealing with a broken wrist. In the cars category, Nasser Al-Attiyah was victorious, driving a Toyota Hilux. It was Toyota’s first Dakar win and Al-Attiyah’s third – his first was with Volkswagen in 2011 while his second win came with Mini in 2015.